Nunholm Squash Club again boasted an array of players at the recent Bridge of Allan Masters tournament. 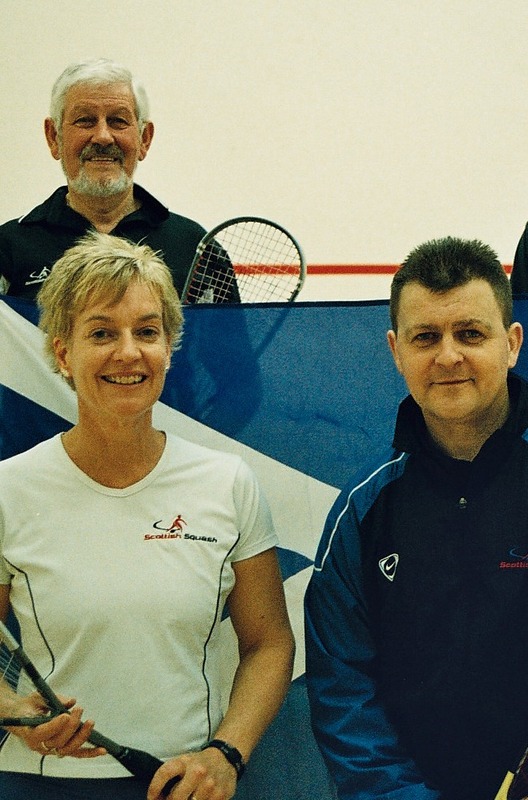 The Stirlingshire club was the venue for the penultimate Scottish ranking masters squash tournament of the season. With a large turnout of internationalists and world championship players in the various age groups and competitors travelling from England, Ireland and Belgium the capacity grounds were treated to some exciting squash. The first Nunholm trophy came in the final of the over 45 event. There Jim Wells from the Dumfries club always maintained control in an entertaining contest to win 3-0 over Chris Holt. There was a near miss for the team in the over 50’s final where Robin Ridley went two games up against Boyd Kidd. Apparently however, on this the Feb 14th weekend, one of Kidd’s female admirers gave him a Valentine’s kiss and told him he had to go and win “for the girls”. Unfortunately this worked and it was Robin who kissed the title goodbye and lost a cliff-hanger 3-2. Nunholm will need to consider revising their motivational techniques. Instead Sue Strachan was kissing the trophy when she proved too strong in the over 35’s age group winning in straight games 3-0 against Julia Horsburgh from Perth. Finally the Dumfries hat-trick came in men’s over-75 section with Dumfries producing their third champion when the grand old man of the club, David Rogan, came first in the round robin format just ahead of Jim Grandage from Hawick to claim yet another masters’ title. The three wins made the Nunholm team the most successful club at the tournament. After a weekend of quality squash the players now move on to the final masters tournament of the season, the Scottish National Championships, this weekend in Aberdeen. With competitors entered in many of the events the Nunholm team are hitting the road again hopeful of more success. That outcome can be found on the Dumfries Sports Club website at http://www.dumfriessportsclub.co.uk/squash where there are also details about the club and how all ages can take up squash in Dumfries.